Are you ready to download WWE Mayhem APK? 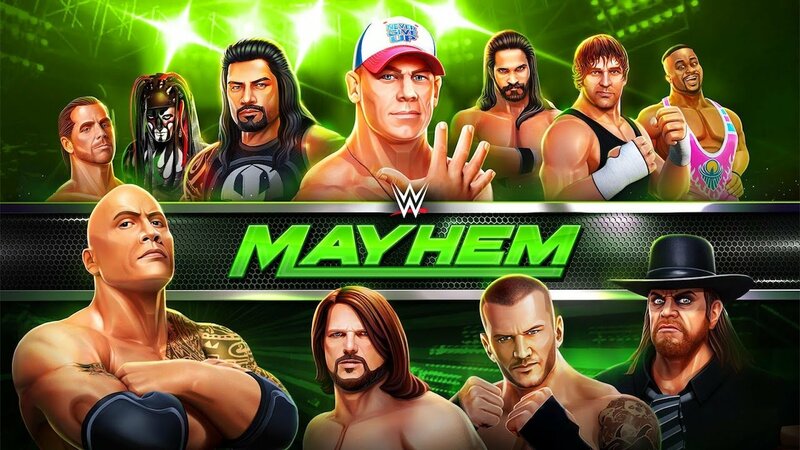 If you are a fan of WWE, you have to play WWE Mayhem now! WWE is a wrestling performance famous in the world. In it, the wrestlers fight each other very fierce that not follow a rule at all. Sometimes the wrestlers get out of the arena and also use items such as tables, chairs, ladders to smash opponent’s head. However, the truth is that these games are written in scripts, which means that they are the performances. Even as the performances, WWE still gives the viewer a thrilling, dramatic sensation. So it makes the viewers feel like watching a long action movie. Getting ideas from WWE, Reliance Big Entertainment has developed and released WWE Mayhem, the latest awesome fighting game in their series. Previously, Reliance Big Entertainment was also known for producing fighting games only, and all of its high-quality products, including such names as Real Steel, Ultimate Robot Fighting and Super Pixel Heroes. ..
WWE Mayhem has quite similar gameplay to previous games. In which players will be involved in the battles 1vs1 in the arena, fight and win to aim for the championship of the WWE. Character control is designed in the Touch & Sweep style, meaning that players only need to perform simple actions such as touching and swiping the screen to control their character to attack, defend and execute excellent skills. The skills of the characters are not the same, each character has a unique set of skills, not duplicate. At the bottom of the screen, there is a power bar, by attacking, you will make the energy bar filled. At this point, you can use the special skills of the character to finish the opponent. To win, only use the skills as guidance is not enough. You also have to know how to combine them to form a continuous combo, prevent opponents from attack, or you will be beaten in a flash. Besides, in Versus mode you can build your own team and challenge your friends. It will be a fun game that will make you and your friends excited. When you defeat your opponent, you will receive rewards including support drinks, spinning tickets to unlock new superstars. The characters in the game are called Superstar with the different indexes. This character system is extremely diverse with real-life graphics. There are 6 different classes in the game. Each has certain advantages and disadvantages. Character classes include TECHNICIAN, BRAWLER, HIGH FLYER, POWERHOUSE, SHOWMAN & WILDCARD. You can catch up with some famous wrestlers such as AJ Styles, John Cena, The Rock. Not all, Randy Orton, Brock Lesnar, Roman Reign, Triple H, and WWE legend Undertaker. Regarding graphics, WWE Mayhem has created an excellent appeal for gamers when it comes to choosing their Arcade style. This is a fun styling design, simplifying the details and just keep the characteristics of each character in the game only. But do not worry, you can still recognize your idols thanks to your unique details. The great graphics of this game transform the fierce characters, the dangerous punches in the real-life punches into something easy to accept and fun. So the game does not limit the age too much. In short, If you love WWE games or fighting games, maybe WWE Mayhem APK is the best choice for you at the moment. You can join in the game and then beat all the wrestlers in there to win the championship. And before you are champion; you have to download WWE Mayhem latest version via the links below, the game has the versions for both iOS & Android. WWE Mayhem MOD APK is ready to download! Depending on your needs, you can download WWE Mayhem MOD APK or WWE Mayhem Original APK. Or install from Google Play / App Store if you want. You unpack the obb wrong way. Another option is to install the original WWE Mayhem from Play Store first. Then uninstall and install the MOD APK file. Please wait for the new mod version. i have to uninstall the last game and then use this??? Any one please? Download the OBB file (A ZIP file contain a folder called “com.reliancegames.wwemayhem“), then decompression to Android/obb/. Final, you can install the APK. The original version has been updated! Our Modders are still working to update as quickly as possible. The MOD has been updated to 1.16.194.